Tom Delay Gary Condit and Mark Foley former Congressmen were members of an occupation considered by the respondents of Gallup polls to be twice as ethical as car sales. Lindsay and Bush optimistically face the impossible task of convincing the public of car salespeople’s basic decency. Given current realities rehabilitating the image of the entire occupational group cannot be done. Rather than fail at the self-assigned task or prevaricate toward more ideal conditions the authors ingeniously create a division between the sleazy cynical “vulture culture” (who seem to be a majority) and the better breed—those who care nice people who happen to sell cars. The Buyer’s Guide isn’t on par with The Seller’s Guide. 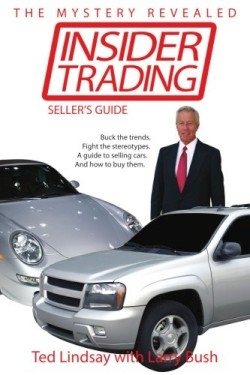 The only information useful to consumers in this latter section of the book is the fact that dealerships average a nine percent markup. When a coach teaches both offense and defense one side receives the greater passion. Despite an aim to avoid jargon and distance-creating clichés some recommended sales phrases sound like burnished slogans from a training seminar. Even so Lindsay’s desire to inculcate the next generation of sellers with positive pragmatic character speaks well of him and can only serve to improve a chronically negative environment. The element of respect is exactly what is too often missing from the lot. Larry Bush was educated at Southern Illinois University. This is the first book for both authors. Ted Lindsay spent thirty-four years selling automobiles from factories and dealerships. His experience-backed approach is more than pure speculation. Mutually beneficial exchanges between buyers and sellers are possible. Given the lack of acrimony when both are satisfied it seems best to approach the exchange with a determination to be agreeable. People in sales careers are the right audience for Insider Trading even those employed in fields unrelated to motor vehicles.